Whatever your needs, there’s nothing that can compare with being at home, a familiar place that holds a lifetime of memories. Care Wish believe that by remaining in your own home, the support and care provided by us, enhances your physical and emotional wellbeing and will help you to continue living independently in the comfort and surroundings you have always known. Our Motto “Time to Care” is precisely what we give you. To our highly trained staff, this is not just a job, but a vocation they have chosen to enter into, because they believe that they can make a difference to the lives of others. Our Carers all go that extra mile, it comes quite natural to them. If you need half an hour or need all day, we can support you round the clock with Carers that really do CARE. 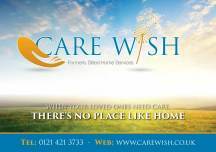 Care Wish promises to treat all those it provides for with integrity, honesty, dignity and respect. That our staff will be competent, trained and professional throughout and will do everything they can to help people maintain their independence and their ability to make good choices about their own lives and the lives of those around them. We promise to match the price of anyone who can offer the same service as care wish provide. Care Wish is registered with the Care Quality Commission. Our service was last inspected on 21st January 2017. Please click here to read our most recent inspection report.